Which NFL Team(s) Make Sense for the L.A. Fan Base? My (not especially numerous) regular readers know that I’m not a huge NFL fan, but I do at least follow major news items of all the major sports: football, baseball, basketball, hockey to some extent. Although obviously most of my posts are about college football, I’ve also written previously about conference and divisional realignment in the NFL. If you didn’t know, three teams have submitted applications to the NFL to relocate to the Los Angeles area. All three teams were previously in the Los Angeles area. The Rams and Raiders moved to St. Louis and Oakland, respectively, after the 1994 season. (The Rams were originally in Cleveland, and the Raiders were originally in Oakland before moving to Los Angeles.) The Chargers had moved to San Diego after playing their inaugural season in 1960 in Los Angeles. I’m from Louisiana (that’s why I came up with the name Bayou Blogger), but I’ve lived in Southern California since 2004, so I feel qualified to comment about the potential relocation of a team or multiple teams to the Los Angeles area. I’m going to split this into two parts. In the first, I’ll talk about NFL TV rules and why I (and probably other fans of outside teams) would prefer the status quo. Since I’m not a big fan of any of them (more on that below) I would rather none of the teams moved here because of the NFL television policy that punishes you for having a local team. For instance, I recently traveled back to the New Orleans area and was not able to watch the Green Bay Packers vs. Arizona Cardinals game because it came on at the same time as the Jacksonville Jaguars played the Saints. If it were Week 1, I might have been happy with the Saints game, but I’d rather watch a game with major playoff implications than a game between two teams who are certain to miss the playoffs. The former turned out not to be a good game anyway, but that’s beside the point. If I were in a secondary market like Baton Rouge or Los Angeles (Los Angeles is a secondary market for the Chargers), I would generally get the closest NFL team (it would be guaranteed if they’re on the road), but it wouldn’t rule out games on other networks at the same time. It’s even worse when the same market has two teams, as the Bay Area does (at least for the time being). I’ll give an example from a few weeks ago. In Week 12 of the NFL season, the Raiders played in the morning (10 a.m. PST), and the 49ers played in the afternoon. It didn’t matter who was on any other channel or how bad the Raiders and 49ers were, the Bay Area got the Raiders in the morning on one network and the 49ers in the afternoon on the other network. Neither network was allowed to have a doubleheader that day. What does that mean? When you’re not in a primary market, one of the two networks (CBS and FOX) gets a doubleheader, meaning a morning and afternoon game (or on the East Coast an early afternoon and late afternoon game), every week. The other network can only show one game but is allowed to choose between morning and afternoon. The two networks alternate in Weeks 1 to 16, and are both allowed doubleheaders in Week 17. So had I been in the Bay Area on that day, I simply wouldn’t have watched an NFL game in either time slot. Therefore, I ESPECIALLY don’t want Los Angeles to have two teams. One more note about doubleheaders: In the Saints-Jaguars example I gave, that was contractually a CBS game since the AFC team was on the road (I have no idea why the contract follows the road team). Had CBS had a doubleheader that week, both FOX and CBS could have shown an early game (although I still wouldn’t have gotten to see the Cardinals-Packers game). Since CBS did not have a doubleheader, fans could only see a total of two games during the day. In sum, having one team limits the ability for me to see games involving other teams, and having two teams would limit that even more. So other than the fact that I don’t want us to have any teams, I’ll also mention that the only one of the three I’ve never actively disliked is the Chargers. I liked Marty Schottenheimer, I liked LaDanian Tomlinson, and I liked Drew Brees. I haven’t liked them as much since all of those people moved on, but unless I wanted them to lose to help out the Chiefs or the Dolphins (my two favorite AFC teams), I was never really against them. So I would go to a game if it were affordable (not likely), and I probably would want them to win most of the time. I never liked the Raiders much at all. The whole bad-boy image never appealed to me. I didn’t mind them when Gruden was the coach, but they became the same dysfunctional franchise shortly after he left. The Rams were rivals of the Saints in the NFC West before realignment, so I never liked them either, although I did prefer them to the 49ers. Both teams have been pretty much irrelevant for several years, so lately I’ve been more indifferent. I still don’t imagine becoming a supporter of either. Since moving here, I’ve lived in the area to the East of Los Angeles. I was surprised by how much loyalty people still had to the Raiders in particular. Whether people are from Los Angeles or not, that’s the team a clear plurality cheer for. It may have even been a majority of local NFL fans. Favorite teams based on Facebook profiles by county in 2014. Since the Rams had played in Anaheim for many years, the only people I encountered who were Rams fans had lived in or very near to Orange County (which sits along the coast between San Diego and Los Angeles Counties) when the Rams still played there. The only exception is I have a neighbor now who flies a Rams flag. I do live closer to Anaheim than to Los Angeles, but it’s unusual to see anything Rams-related unless I’m going toward Orange County. I was still a bit surprised with the level of support I saw. The Raiders seemingly had much more support in 2013. I’m not sure if there is a difference in methodology. I heard or saw very little about the Chargers until the last few years. I think Los Angeles was given secondary market status almost immediately when the other teams moved, but I guess it took a while for people to warm up to them. A few years ago, they got a contract with one of the local FM stations to broadcast their games. Right about that time, I noticed increased coverage of them in the news, but they’ve still been second fiddle to the Raiders. I don’t hear or see any reference to the Rams in the local media. 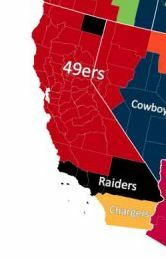 Occasionally the 49ers are mentioned, I guess because they’re in California and a fair number of people have moved between the Bay Area and the Los Angeles area. 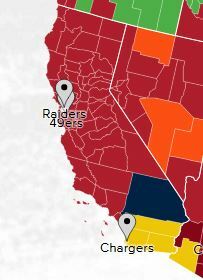 According to Twitter, every county in California contains more 49ers fans than Raiders fans, although the other maps disagree. Twitter provided the only map I could find that gives more details than the respective top team in each county, and the Rams were not even in the top 3. That being said, there are still a decent number of Rams in the area. Twitter just looked at how many people followed the teams on Twitter, but there aren’t huge differences. The New York Times did a baseball map by ZIP code, which I think would be more informative, but I could not find anyone who did that for the NFL. Anyway, the above indicates to me that once their Missouri fan base vanishes, the Rams would be a team without a clear geographic fan base, similar to the Mets, Jets, and Clippers. Some people say that the Chargers will have to start their local fan base from scratch. That’s not really true, especially not if you compare the Rams’ numbers above. I don’t think they would have much more trouble attracting local interest than the Rams would, although I do think the remaining Rams fans are more loyal fans than the local Chargers fans are. 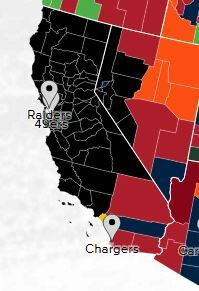 Still, it would be hard to see the Rams being the more popular team even if the Raiders stayed in Oakland. Unless the other team turns out to be great, I see the shared stadium with the Raiders working out about how the Clippers and Lakers originally worked in the Staples Center. Even with much cheaper tickets in the same venue, people just didn’t care about the Clippers. If it’s the Rams and Chargers sharing the stadium, I don’t think things would be as lopsided. Also, I think it’s better for the two teams to be in different conferences. I don’t think that interferes as much with crossover fans. This is a map of second-favorite teams by county according to Twitter, which makes 49ers fans seem more common than Facebook does. We have a lot of fairweather fans in this area. I don’t really like it, but I think it does speak to the ability of fans to potentially support two teams. There has been a recent migration of fans from the Angels to the Dodgers, for instance. There isn’t that much local support for the NHL to know for sure, but I suspect the same thing about Ducks fans becoming Kings fans when the latter started winning Stanley Cups. I think the Clippers draw more from unaffiliated or relocated fans than from Lakers fans (someone who moved from Boston or New York would much more likely support the Clippers), but some Lakers fans probably do support the Clippers for the time being. Since they have almost never been good at the same time, there isn’t such a rivalry as to prohibit that. For whatever reason, there is quite a rivalry between Chargers fans and Raiders fans, so that’s one situation where I don’t think fans would be as likely to cross over regardless of how good the teams are. However, it appears those two have much less work to do than the Rams would in getting their support to high enough levels in the area. Great post and I agree with you. I don’t see why any football fan in LA would want to sacrifice the doublehaeder to have a local team. Who can afford to go to a game anyway? One or two games is one thing. But if that’s all you want, you can travel to any of the teams within 7 hours by car/1.5 hours by plane (San Diego, San Francisco, Oakland, Arizona). I wouldn’t even want to do that. I’d rather go to 2 or 3 baseball games or buy 10 movie tickets or whatever the equivalent would be. Exactly. That’s why I like dumpy ol Oco Coliseum. People screaming for new designer ballparks ought to shut the hell up. Who needs to pay $50.00 for parking? Old stadiums have more character anyway. I get sad when they’re replaced.